Ladies Join us for again an amazing workshop of 2 HRS by Natasha Terekhina from Russia/Spain for some extensive lady styling and techniques for your ZOUK Dances. 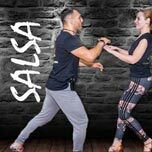 Learn to improve your body, posture and balance based on technical foundations and the application to your dances and finish your styling along the way! Don’t miss this great opportunity to learn from this great artist who has meant a lot in the development and inspiration within the Zouk world! Price for 2hrs workshop: 25 Eur until 20th of november. After that the price will go up to 30 Eur.